Why would we cure cancer using potent toxins in patients? 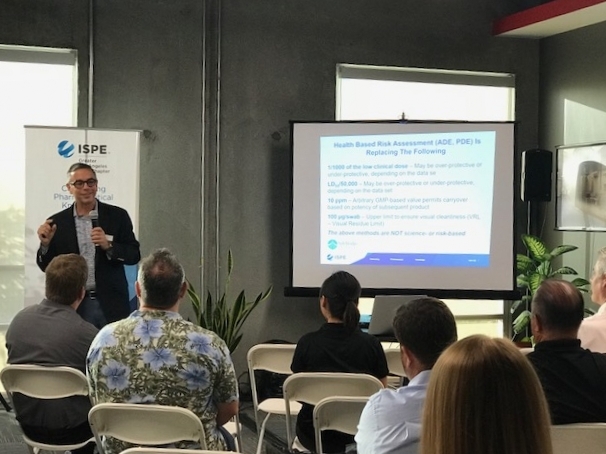 During the ISPE LA Latest Technology in Containment Considerations for Conjugation and Fill Finish of ADCs Using HPAPI Toxic Multi Product Facilities, we learned that the use of conjugated proteins and toxins target the cancer cells while minimizing collateral tissue damage. The idea is genius, but the manufacturing the toxins and the prevention of unexpected impact and reaction is still developing new ways to minimize negative impact and streamline production. Richard Denk (SKAN) expanded into the technology and importance of isolators for toxin manufacturing and filling. Michael Molony (Ajinomoto Althea) dived in to the significance, challenges, and potential solutions for analyzing product conjugation concentration, polarity, size, and distribution, to name a few, and manufacturing considerations for a CMO. Allen Ader (Safebridge) revived the group while interjecting with jokes during his presentation, regarding the safety considerations for exposure and use of product in patients and employees. John Dumas (IPS) closed out all of the presentations with his project to segregate one site to manufacture drugs of high and low potency, using physical and airflow boundaries. It was great mingling with all those that attended and meeting the intellectuals that spoke and the great team that helped make Ajinomoto Althea’s new filling facility. Thanks to the welcoming staff at IPS for a great spread and hospitality. Newer PostMeet Joycelin Luc, Project Engineer at Delta PM! Older PostMeet Delta PM's Accounting Manager, Steve Sim!